In the last several years, a growing body of scientific evidence has indicated that the air within homes and other buildings can be more seriously polluted than the outdoor air in even the largest and most industrialized cities. Other research indicates that people spend approximately 90 percent of their time indoors. Thus, for many people, the risks to health may be greater due to exposure to air pollution indoors than outdoors. - Environmental Protection Agency. I wanted to let you know that the two young men who did our cleaning, I believe both are Jim, we fantastic. They explained everything they were doing and were friendly and professional. We couldn't ask for a better experience with your company. Please pass our thanks on to them both. Dalton Environmental Cleaning strives for "total source removal cleaning" -the NADCA standard which means all supply & return ductwork is accessed to remove light & heavy debris. At Dalton's we car about your home, so the first step is our knowledgeable, uniformed technicians will explain our process and answer any questions you might have. Our technicians take care to put on boot covers, place protective tarps, and corner guards. The door or window where our hoses come in ar also sealed with tarps. In preparation, a ten-inch diameter access port is cut into the main supply & return trunk line for our vacuum hook up. This applies vacuum (negative-pressure) to the entire duct system & prevents airborne particles from blowing out the vents. The next step involves high compressed air cleaning of all registers in the house. This is done with specialized air tools that not only clean the vent but is also designed to fit through the louvers to clean behind it. Now it is time for the ductwork! The crew drill 1 inch access ports into the main and branch runs of the duct system so a tool known as an air whip designed specifically for duct cleaning can be inserted. This tool has multiple whips at the tip of it and is powered by approximately 250 lbs of air pressure. This enables the tool to snake its way through the duct and at the same time aggressively beat all sides of the duct loosening all dirt/debris and pushing toward the powerful vacuum. The whips are placed into each and every duct mechanically removing all the debris. Once the crew ensures a completely cleaned system by manual, visual, and or camera inspection, the access ports are sealed. The vacuum access is sealed with a finished galvanized sheet metal plate that is zip screwed in place. The 1 inch ports are sealed with an airtight, flush-fitting cap plug. 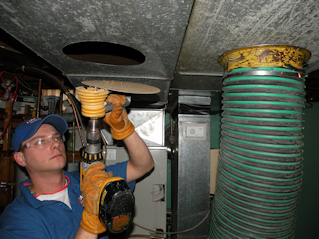 Our crew will clean the blower housing (the fan area) of your furnace with compressed air. OPTIONAL: As a final step, an antimicrobial treatment to deodorize and inhibit growth of bacteria, mildew, & mold can be fogged into the duct system. We leave you with before & after pictures to share with your friends & family. DON'T FORGET TO CONSIDER CLEANING YOUR DRYER VENT-ONE OF THE LEADING CAUSES OF HOUSEHOLD FIRES! 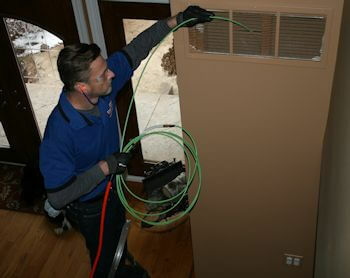 What you need to know about Air Duct Cleaning. Find out what our some of our customer say about us.